Ashley Chloe has launched a Kickstarter campaign for the Helix Cuff, a digital wearable accessory that unites fashion with function. Ashley Chloe (www.ashleychloe.com), the company aimed at bridging the gap between fashion and function in wearable tech, has reached full funding on Kickstarter for its flagship digital wearable accessory, the Helix™ Cuff. 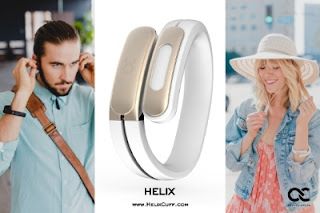 Earning support from backers in more than 136 countries since launching on July 20, Helix has handily surpassed its funding goal of $100,000, meaning the Helix Cuff dream will now come true. The pre-order campaign continues through September 17th at http://kck.st/1MfOEAy. Helix is the first wearable wrist cuff with stereo Bluetooth® wireless headphone technology. The portable Helix Cuff provides on-the-go access to tiny in-ear headphones that you pair with your favorite mobile, wearable and smart devices across various OS such as Android and iOS. Helix provides stereo-sound quality, a built-in microphone, and track/call control ability. The unique design of Helix allows you to wrap the connecting cord for the headphones into a groove on the cuff while you are traveling or on the go. Helix is available in black or white with silver or champagne gold metal embellishments, and in an 18K gold edition in red. Helix will be sold through the Ashley Chloe website at www.HelixCuff.com after the Kickstarter campaign closes. "We couldn't be more thrilled with the tremendous support we've received on Kickstarter," raved Angela Pan, founder of Ashley Chloe. "Thanks to the amazing backers who believe in our vision, we are now able to bring Helix and our dream of stylish, wearable headphones to life." 0 comments on "Ashley Chloe Reaches Kickstarter Funding Goal for its Helix Cuff Wearable Digital Accessory"